Ireland is home to some of the world's most impressive crystal design, among them Shannon Crystal. The craft of Irish crystal making is an art form that has been developed and modified over hundreds of years, going back as far as the Celts, who brought the first glass to Ireland in the form of beads for jewellery making. However it was the English glass maker, George Ravenscroft, along with the influence of French and Flemish craftsmen, who helped make crystal, including Shannon Crystal, into a valued commodity. Shannon is one of a number of famed Irish crystal design companies. Geologically, Ireland is well suited for the manufacture of Shannon Crystal. The Kinsale Crystal website states that early glass made from sand often resulted in a greenish hue due to the presence of iron. In Ireland, however, craftsmen had access to the white sand found in the Wicklow Mountains, which was very pure and created the clear glass that formed the basis of crystal making. 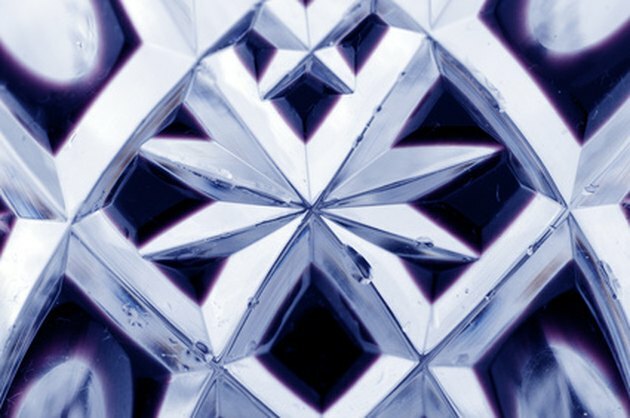 In the 17th Century, a process vital to the development of crystal was patented, states the Irish Culture and Customs website. The English glass maker George Ravenscroft discovered that by adding lead oxide to molten glass, he could create a rock solid, sparkling substance that was soft enough to carve. Thus lead crystal was born. In 1685, the Edict of Nantes was revoked by the French King, Louis XIV, and Great Britain and Ireland saw a surge of French and Flemish immigrants who brought their trades with them. One of those trades was glass making. Shannon is located in Western Ireland. ShannonAirport.com describes the area as a region steeped in culture. It is the birthplace of traditional music and the home of The Cliffs of Moher, the top visitor attraction. Shannon Crystal is one of several crystal design companies with Irish roots. Others include Waterford and Heritage Crystal. The company has a catalogue of beautiful lead crystal, offering products from candlesticks, to vases and decanters. Although you can still purchase Shannon Crystal, it is now a department of Waterford Crystal according to Shannoncrystal.net. The Shannon Crystal plant is located in the Czech Republic. Katherine Crabtree has been a professional writer since 2006. She has written press releases, marketing copy, articles and blogs for several businesses, including UKFast and Appliances Online. Currently, she works for creative agency, P H Media across a huge variety of brands — from Toni and Guy to Hoover. Crabtree has a Bachelor of Arts in journalism and broadcasting from the University of Salford.